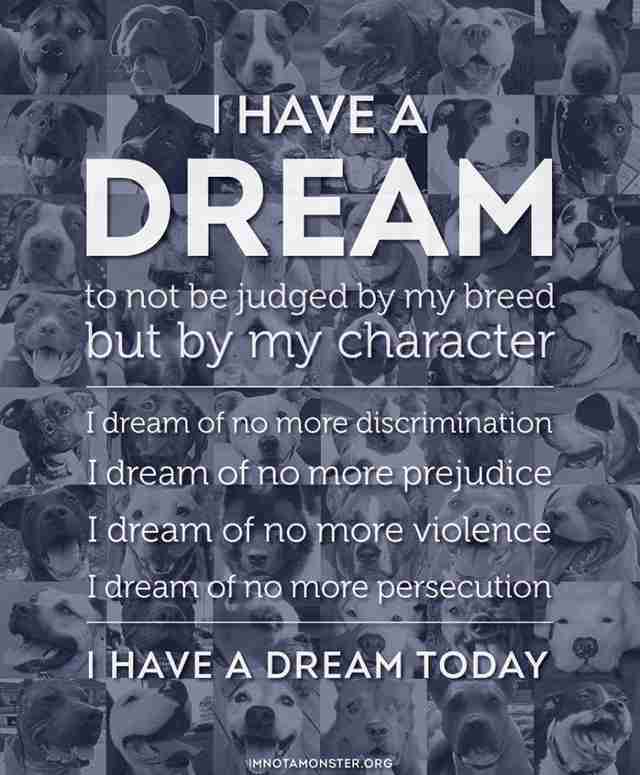 "Having a pit bull did not automatically make me an advocate. Having someone judge my dog, dismissing his wonderful qualities because of his breed, did." For as long as she could remember, Imelda loved dogs. Growing up in Indonesia exposed her to both street dogs and pedigree dogs and she learned much about how both types of dogs lived. However, it wasn't until she had a negative encounter with her newly adopted pit bull that she had the idea to speak up for these dynamic dogs. 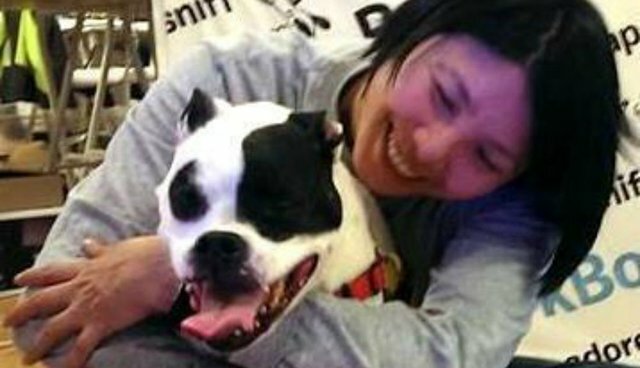 When she brought Rosco home she was met with people telling her that the pit bull was dangerous, even sharing stories about pit bull maulings they read in the news. Imelda gazed at her new family member curled up on the living room floor, sleeping and oblivious to the reputation he had and sadly realized how stereotypes affect the chances of certain breed types getting adopted. 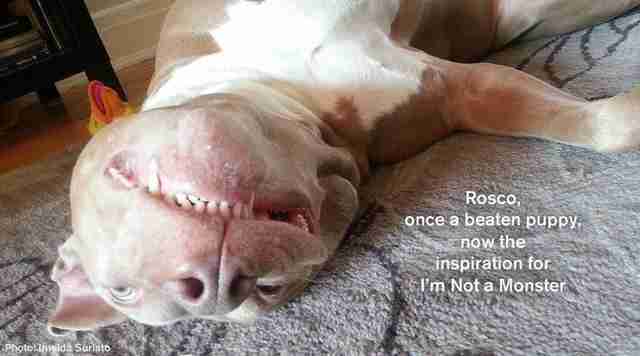 In July of 2011, Rosco inspired her to create, I'm Not a Monster™, a website where dogs theoretically tell their own stories and in doing so, change the way people think about them. The very first "monster" was Rosco's story. 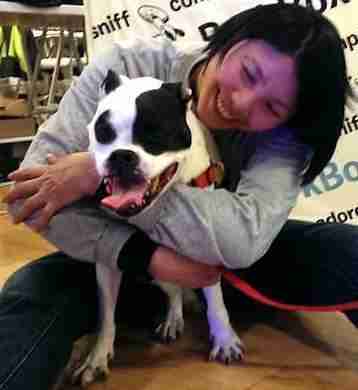 Imelda then sought out friends to submit their dog stories. After that she started surfing as the web and social media for dogs whose stories needed to be told. Sometimes, she had to convince the dogs' owners that she was using their stories only for good; she was not seeking funds or favors. The stories she heard all related to misunderstood breeds (not just pit bulls), including discrimination, abuse and shelter abandonment. Soon she no longer sought out monsters, they found her. Imelda wasn't concerned that the name of her website would be taken negatively. She found people often nodded in agreement because they understood how these dogs are labeled. Imelda states: "It's also a conversation starter. By stating 'I'm not a monster, I am a ... ,' the momentum begins and the story is told." At first, hers was a site where dogs could tell their stories through their people. Then it became an area of advocacy and education. The sites content and followers spiked when all efforts to help a pit bull mix dog named Lennox failed to save him from forced euthanasia at the hands of the government in Belfast. Imelda created banners using the words, "I am Lennox" for her friends and followers and they started popping up on pages all over social media. In 2012, Imelda came across some clearance items in a store that she bought and set aside to give to her local shelter for the holidays. That action sparked the Monster Holiday Drive. She recruited some of the "monsters" whose stories she shared to do the same. They campaigned for the rescues and shelters of their choice by setting up donation locations, collecting donations and using donated funds to buy items needed for the animals. The first year approximately $20,000 in donations was raised. The amount of participating "monsters" doubled the following year and 34 individuals and groups brought the total donations to nearly $100,000. Imelda received sponsorships through animal-companion conscious companies like American Dog Magazine, Bark Box, Earth Rated, Kong and Wellness. "Monster elf" participation rose so fast that the advertisement posters for the drive became outdated almost immediately. 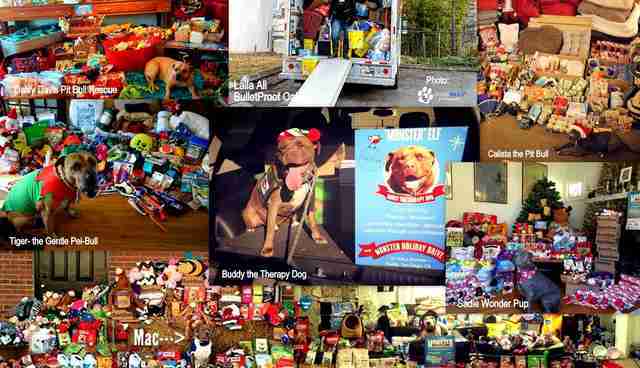 The 2014 drive resulted in 74 "monsters" campaigning for donations and astonishingly, over $420,000 worth of donations benefited 138 shelters and rescues across the US and internationally. Natural Balance and Let There Be Collars have already come on board for 2015's holiday drive. "By alleviating some of the burdens on shelters and rescues, we help the organizations focus on other aspects of their business such as adopting, vetting and training. A bag of food for the animals could mean a second chance at life." Now, Imelda calls her work, "elf herding" because she offers coaching and advice to those wishing to get involved in donating as well as helping those in need of donations. She continuously educates herself about breed specific legislation, attends events like the Million Pibble March and recruits more "monster elves" for the Monster Holiday Drive. Cuda has been a "monster elf" for all three drives so far. Imelda has also created an online store and 100 percent of the net profits are donated to rescues to help them operate. I'm Not a Monster™ and the Monster Holiday Drive helped shape the mission statement of Cuda Cares: "Until they all have homes, let them have toys, let them have food. Let them live." If you are interested in telling your story or helping with the Monster Holiday Drive, please visit, I'm Not a Monster's website or visit the facebook page at I'm Not a Monster.